The Royal Salute Tartan was based on the Chivas Brothers which was founded in 1801. Part of Chivas Brothers Crest on the Chivas Regal Whisky bottle is Robert the Bruce with whom there is a long time association. 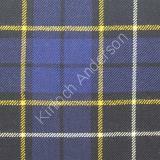 After the Battle of Bannockburn Robert the Bruce conferred certain privileges on Aberdeen which is where Chivas Regal was originally sold.The colours of the tartan comply with the Royal Salute brand colour palette of white, gold and royal blue and silver grey is present to represent the association with Aberdeen.